Firefighters are tackling a large blaze at a timber yard which led to the closure of a motorway slip road. 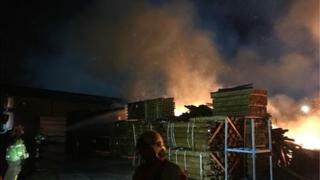 More than 40 firefighters were dealing with the blaze at the Park Lane industrial estate in Bryn, Wigan at its height. Greater Manchester Fire and Rescue Service said it broke out at about 01:30 GMT but was now under control. The M6 slip road at junction 25 and part of the A49 were shut due to the smoke and have now reopened. Lee Coleman, from the fire service, said the blaze was unlikely to spread and he was confident it would soon be extinguished. He said: "The fire itself is contained but still remains 50m by 50m with smoke continuing to spread into the immediate area. "I'd ask people living, commuting or working nearby to remain mindful of the dangers of inhaling smoke - please keep windows and doors closed as a precaution." A contraflow system was in place on the local road network "in an effort to keep Monday morning traffic moving", he added.